Alright, I own a 2010 Gen Coupe 3.8. So back in October 2018 i installed headers, downpipes, and test pipes in addition to CNT V3 CBE. The mid resonator was also replaced with an X-pipe. I was awfully disappointed with the result, which was a loud, ugly, metallic raspy exhaust note. Me being a noob didnt research deep enough to anticipate this. I temporarily remedied the issue by taking out the X-pipe and installing two 24 inch resonators based on advice given to me by my mechanic. However, I am still not satisfied. The exhaust note is a bit tame now but the drone is quite bad. So what I am going to do is put the OEM headers back in and take off those resonators. Now the part where I need some advice. I want a fairly deep, aggressive, but smooth exhaust note or as close to that as I can get. I was aiming for this from the start. Something that largely eliminates the rasp. After the Primary cats and downpipes, what should the rest of my setup be to achieve the exhaust note that I want? I have installed a Catback CNT and test pipe Ark. I replaced the Center resonator with an x-pipe but to eliminate the extra RASP I had to added 2 bottle style resonator from vibrant performance (1792) just before the x-pipe. Now the exhaust note its perfect and deep just like I want. As for the header you have to expect a minimum of RASP but I read on the Forum that if you weld a pipe between the downpipe that helps enormously for the extra RASP and drone. I went thru this same issue, but with the Stillen exhaust, which is pretty much the same design as the CNT when you add a x-pipe. I had wicked bad rasp when I installed headers and test pipes. I went the other route first - I switched to Ark Grip V2 cat back and things improved but there was still a lot of rasp anywhere above 4000RPM. Like you, I too put my stock headers back on - that alleviated all remaining rasp and drone. The Ark is well suited for keeping things quiet when cruising with the dual reservoirs off the rear canisters. 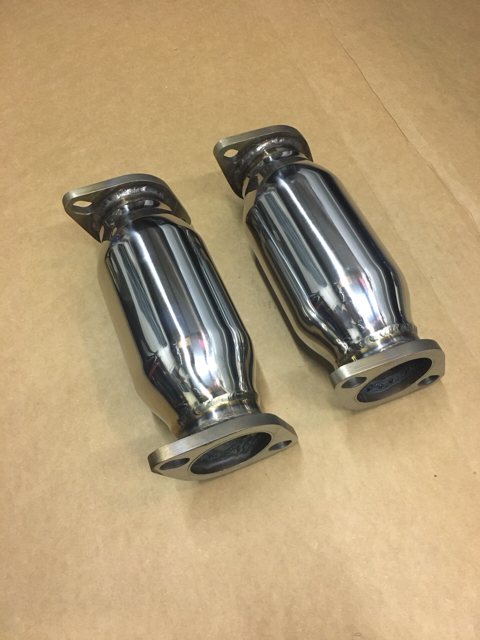 If you're going to run CNT and want no rasp, you'll probably have to run stock headers, X-Pipe or alternatively stock secondary cats - that's the only way to keep these smaller canister exhausts chilled out and smooth sounding. Thanks fellas for the responses. So heres what i think i’ll do. Stock headers-downpipes-test pipes-x pipe-CNT exhaust. What do yall think if in the case this does not do it that i have the mechanic turn my straight test pipes into an H pipe to eliminate rasp? (Thats what I’ve read...) Yall think an H-pipe/X-pipe combo setup will sound good? Do either H-Pipe OR X-Pipe... both is a waste of time as they perform the same function...allowing a bit of pressure equalization between the pipes to smooth things out. There wouldn't be much change in sound. Consider some resonator setup - eliminating any resos in the flow is going to bring drone in. You'll want something that keeps noise down below 4000RPM so you can cruise without bleeding ears. Honestly, the CNT mufflers are probably just not up to the job if you have no cats. The headers are going to do most of your work, so do that first, then introduce changes to alter the sound to your liking. @TKJode alright thanks for that advice man. Appreciate the input. Depends on how well they were welded. If the transition sections aren't deburred and/or they welded over an overlap, that would cause some noise. It's easy to weld to hide these. I killed a ton of rasp by wrapping both of my downpipes in DEI titanium heat wrap. It helped sooooo much. H pipe at higher RPM's is less effective do to flow characteristics . Secondary cats do an enormous job of taming rasp. However, they’re not great for sound volume, tone, or power. I’m running stock headers/downpipes, but the exhaust was too tame w/ the secondaries in. On go the test pipes and I unleashed the Gods Of Rasp. That wasn’t going to do. My solution was to have two resonators fabricated from Vibrant 1792 bottle resonators and their flanges. The results have been perfect. No rasp, plenty of volume under load, no drone (Magnaflow CBE) and great tone. so youre saying that test pipes produce bad rasp, even with the primary cats back in place? They did for me. I may be overstating it a little bit, but although I liked the exhaust sound at idle, any load part throttle or more produced a nasty rasp I just couldn’t tolerate. @L8Braker hey man, I know we already discussed this a bit in the resonated test pipes thread, but do you need to get the car tuned after replacing the secondaries with resonators? I’ve thought about getting the Vibrant 1790 Bottle Style resonators to pair with my CBE, so with it being a slightly smaller diameter, I’m wondering if this will make the car run too rich. As I’ve heard can be the case when removing the cats off certain vehicles. Not sure if that’s the case with these cars though. I don’t have a tune. Any good tune based on your mods would likely produce improved numbers, but I wouldn’t say it’s required. I have my primaries still on and no CELs. Alright i was thinking...where in the exhaust system would vibrant resonators perform the best: further from the exhaust exit (such as, in place of the secondary cats) or closer to the exhaust exit (in my case, before the CNT dual mufflers)?